In discussing The Return of Bruce Wayne, we've told you that Batman traveled in time, but not in space. We've also told you why that wouldn't possibly work. But that wasn't the original idea - when he was first working out the storyline, Grant Morrison planned to have Gladiator Batman running around Ancient Rome. That idea may not have made it into the comic, but it did show up in the Brave and the Bold episode inspired by the story, "Time Out for Vengeance." And so did the idea of Batman as a pirate. At the end of his time in 1640, Bruce dove into a waterfall, and it was the summer of 1718 when he washed out in the bay at the bottom. Interestingly, Bruce's time jumps were accompanied by solar eclipses, and there really was one that swept across America (stretching from North Dakota to Lake Superior when it started, and from South Carolina to New Hampshire when it ended) on October 21 of that year - not quite a perfect match, but remember that the DCU Earth is slightly larger than ours is, so their astronomy may be different, as well. 1718 was the only time Bruce met a real historical figures on his travels: Edward Teach, aka Blackbeard, and his first mate Israel Hands. That's how we're able to date this adventure so specifically, in fact. A caption mentions that Blackbeard was hanged two months later, and we know that he died on November 22; two months before that (even allowing for a few weeks in either direction, if the speaker was rounding off) puts Bruce's arrival in late summer/early fall. 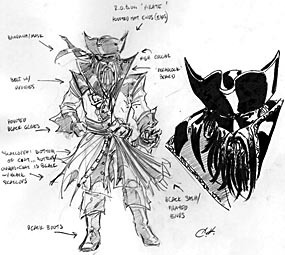 High Seas Batman is not based on the character as he was seen in the comic - there, he was still wearing the remnants of his pilgrim clothes. Rather, this is based on Andy Kubert's character designs, which were used for the cleverly interlocking covers. 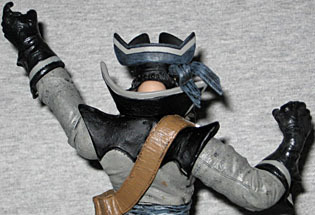 His coat and his undercoat both have a scalloped lower edges, to suggest Batman's cape, and two of the corners on his tricorn hat stick up - acting as stand-ins for his bat ears. His utility belt is now a heavy leather sash slung over his shoulders - you can tell it's a sash rather than his actual belt because the flaps on the pouches would face the wrong way if it were worn around the waist. 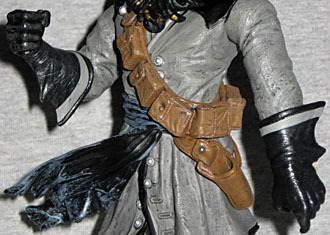 There are points on his gloves, a high collar above the coat's pointed shoulders and a black sash tied around his waist. This could easily just be an average pirate, but if you know it's Batman there's no missing the parallels. 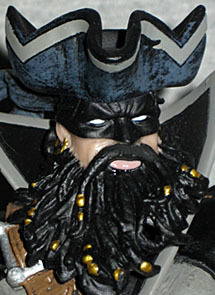 Although they were both sculpted by Ray Villafane, High Seas Batman does not appear to share the same face with Prehistoric Batman. Of course, it's rather hard to judge, since all you can see of this one's face is a bit of cheek and his ears. As we said, he's wearing a black bandana with eyeholes cut out of it to serve as a mask, but the bottom half of his face is obscurbed by a full, bushy beard. Okay, not so bushy: drawing inspiration from Blackbeard (in real life, not in the comic), his beard is twisted almost into dreadlocks, and it's adorned with golden beads. Bruce finishes off his look with large hoop earrings - sculpted, rather than swinging free. As cool as these Return of Bruce Wayne figures look, the articulation has been vastly disappointing on all of them. 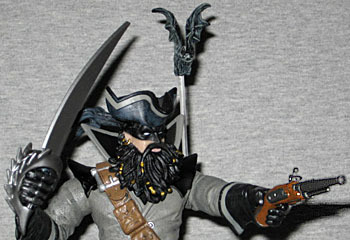 Pirate Batman has a balljointed head, swivel/hinge shoulders, T-hips and swivels for his boots and gloves. That's it. While we can overlook the lack of knees (there's not much point to them, since the coat restricts him from getting into any sitting poses) the lack of elbows on a modern toy is just inexcusable. Now, it must be said that these are all highly detailed sculpts with no repaint potential, so the molds won't be getting any additional use, but as a cost-saving measure, leaving out important joints is a bad move. We're not talking about swivel biceps or thighs, but elbows! He can't move his arms, guys! He comes with a flintlock pistol and a curved sword with an ornate handguard, but all he can ever do is hold them in one basic pose. So sad! There's a sling on his sash to hold the pistol, but you'll never use it, since you can't do anything with his arm to make it look good when he's not holding the gun. The funniest accessory is a bat on a clear plastic stick: it plugs into Batman's shoulder so it looks like it's hovering there, rather like a pirate's pet bird. Despite all the bad things we had to say about High Seas Batman's entirely sub-par articulation, I'm still glad to have him. 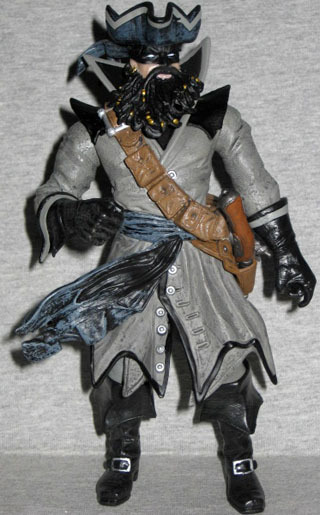 The design is very cool, and while he can't possibly stand with good comicbook figures, he'll look good facing off with other pirates. Even better if you get him for cheap, from some place like Thwipster or Figure of the Day.